Hot Stone Massage is particulary benificial to those suffering from Trigger Points, or Fibromyalsia. The heat penitrates the tissue, without causing pain reactions normally associated with direct pressure. Here the stones use a much larger sufface area thereby decreasing the actions of tissues usually agravated by this type of pressure. Come experiance frst hand the power to Hot Stone Massage from Shanti Living Wellness. We promise you will not be disapointed. 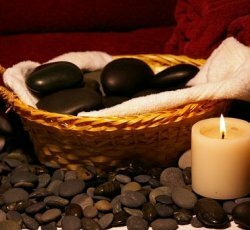 Hot stone massage is an additional $20 dollars added onto any massage greater than 60 minutes long.